We have miter saws with lasers, drills with lasers, and even hand saws with lasers, but up until now I have never seen a table saw with a laser. Rockwell has finally given us the laser line table saw you never knew you needed. The laser is designed to make it easier to see exactly where the saw blade will meet the wood, and should really come in handy for getting accurately sized miter cuts. The laser grabs our attention, but there is more to the saw. This is the first jobsite table saw from Rockwell and they have packed it full of features and accessories options. The saw has a full 3-9/16 inch cutting capacity which allows it to cut through 4x4" dimensional lumber, and has a 30-inch rip capacity to the right side of the blade. The optional Sliding Extension Table (RW9189) increases the rip capacity to 36-3/4 inches, and enables crosscuts up to 28 inches. Another interesting optional add-on to the saw is the Rockwell Finisher (RW9188). As crazy as it sounds, this add-on turns your table saw into a portable jointer. It can handle stock up to 11 inches wide and 3-1/8 inches thick. When used in conjunction with the Sliding Extension table, it can handle sheets up to 36-3/4 inches wide. 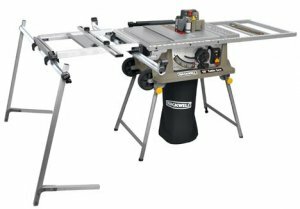 The Rockwell 10 inch Jobsite Table Saw with Laser (RK7241S, $349.99), and the optional accessories are expected to be available the first quarter of 2011. For those hungry for more information check out the Press Release after the Read More. Charlotte, NC ? Rockwell has entered the field of jobsite table saws, and has redefined the category by introducing a saw capable of cutting a 4x4 in a single pass. Ordinary benchtop and jobsite saws have a maximum cutting height of less than 3-1/2 in. The Rockwell saw's capacity is 3-9/16 in., enabling it to zip through 4x4 dimensional lumber. This hearty portable saw also earns top dog honors in featuring a 30-in. ripcapacity to the right of the blade. Users can take a 4x8 sheet of plywood and rip it in half with full support. Add the optional Rockwell Sliding Extension Table to expand the saw's cutting capacity and exclusive Rockwell Finisher attachment, which planes the edges of wood up to 11 in. wide and 3-1/8 in. thick. This portable saw setup offers loads of versatility while maintaining a compact footprint in the shop or at a jobsite. The Rockwell Table Saw also features Laserguide™, a laser cut line indicator that follows the path of the blade and never needs adjustment. Straight or bevel cuts, the laser line projects itself onto a window in the work surface. There's no guess work on where the blade meets the wood. Right out of the carton, the 10 in. jobsite table saw with laser is ready for operation. The base of the saw incorporates a sturdy fold-down trolley stand with wheels. This saw has onboard accessory storage and can be rolled from one jobsite to another by using the outstretched leg as a pull handle. The stand also features an adjustable leg extension for set-up on uneven surfaces. The portable jobsite saw has a 15-amp universal motor with a no-load speed of 5000 rpm. Overall table dimensions are 28-1/2 in. x 19 in. with a 30 in. rip capacity to the right and 11 in. on the left. Depth of cut is 3-9/16 at 90° and 2-9/16 in. at 45°. Its dado width is 1/2 in. The 74-lb. saw includes a rip fence, miter gauge, push stick, riving knife and sawdust collection bag. The Rockwell 10 in. Jobsite Table Saw with Laser (RK7241S, $349.99) has a two year warranty. It is expected to be available the first quarter of 2011 at rockwelltoolsdirect.com and other online Websites, including amazon.com. Various local retailers such as Menards and independent hardware stores and lumber yards also are expected to carry the saw. The Rockwell Sliding Extension Table is easily attached and removed from the saw. When not in use, it folds for compact storage and transport. Imagine having the ability to handle large cutting capacity jobs with sliding crosscuts up to 28 in. and fixed rip cuts up to 36-3/4 in. without a permanent set-up or the expense of one. Beyond cutting sheet goods, the sliding extension easily sets up 1x and 2x stock cuts. Miter cuts also are easily mastered using the sliding extension table. The Rockwell Sliding Extension Table (RW9189, $179.99) is expected to be available in the first quarter of 2011 at rockwelltoolsdirect.com and other online Websites, including amazon.com. Various local retailers and independent hardware stores and lumber yards also are expected to carry the accessory. Consider a portable hand-held planer in the workshop or jobsite. Now, visualize its usefulness in a fixed position, mounted to a saw table so it functions much like a jointer. Rockwell's engineers drafted the features and performance characteristics of a conventional hand-held planer and married them with a fixed mount cutting accessory called the Rockwell Finisher. This exclusive table saw addition mounts to the top of the Rockwell Jobsite Table Saw and finishes the edges of work materials to an accurate width at a fixed rate of 1/12 in. per pass. The Finisher is quickly fitted and removed without the need for recalibration. It handles wood up to 11 in. wide and 3-1/8 in. thick. When used in tandem with the Rockwell Sliding Extension Table, it will plane the edges of even coated/veneered sheets up to 36 3/4 in. wide. Before/after results demonstrate its ability to provide a smooth, chip-free edge without saw marks. It reclaims old lumber by exposing a parallel, smooth new finish ready for light sanding. The Rockwell Finisher's housing is constructed of high-impact composite and the table saw accessory is powered by a 6-amp motor that operates at a no-load speed of 16,000 rpm. It mounts to the jobsite table saw through two pre-drilled holes. Two locking thumb screws secure the accessory to the saw's table. Its hardened steel cutter knives are reversible and replaceable. The accessory weighs 6.6 lbs. The Finisher is equipped with an 8 ft. power cord and chip collection bag.